Heading into the 2017 NHL Draft, the Leafs will have a different perspective than they did in 2016. Just one year ago, Toronto had 11 draft picks, including five in the first three rounds. This year is a different story, with just seven total picks and only two within the first 109 selections. However, the minimal number of draft picks is a testament to the Leafs’ breakthrough season in 2016-17, prematurely finding success as a team in the midst of a rebuild. In any case, the Leafs’ 11 picks from 2016 have now gone through a year of development and it’s time for a checkup.Some prospects have grown leaps and bounds, while others have turned stale in their development. Regardless, the Leafs have a stockpile of promising and intriguing players in their system. Here is a recap of how each of the 11 draftees from 2016 turned out. The one draft pick that had an immediate impact on the Leafs is, of course, Auston Matthews. The 1st overall pick has already become the Leafs’ cornerstone player and is a finalist for the Calder Trophy as rookie of the year after potting 40 goals. With this pick, the fate of the Leafs’ future changed instantly. 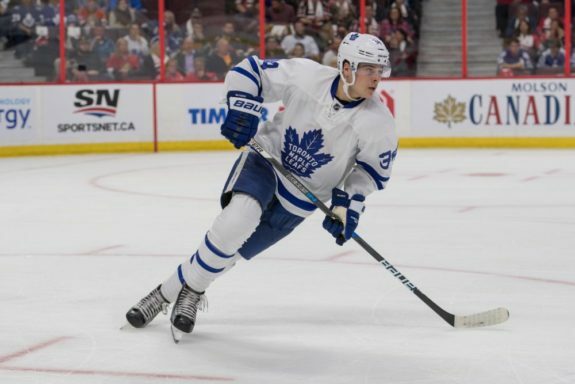 Matthews is a game-changer, as proven by his NHL debut when he scored four goals against the Ottawa Senators, including a candidate for goal of the year. Heading into his second season in 2017-18, Matthews is already a favourite to be Toronto’s next captain. The 2016 NHL Draft will always be considered a success for the Leafs thanks to this acquisition alone. The selection of Yegor Korshkov quickly became a debated choice for Leafs Nation. The Russian forward was in his third draft eligible season, making his selection at 31st overall a surprising one. Despite unspectacular numbers in the KHL as a 1996-born prospect, Leafs brass believed that he was just scratching the surface of his potential. Fast forward one year, and Korshkov slightly improved upon his draft year totals. His 19 points were tied for 19th among players under 24 years old, and his 0.53 points per game were 12th best. At this point, Korshkov remains an intriguing prospect in the Leafs’ system. However, passing over exciting players like Alex DeBrincat and Tyler Benson, who are both two years younger, will have fans scratching their heads for the time being. Late in the second round, Toronto selected Carl Grundstrom, a Swedish prospect from the SHL. In 2016-17, he added to his offense from his draft-eligible season, especially in the goal department. He was able to show a true goal scoring ability with a pro-level release. Among players under 20 years of age in the SHL, Grundstrom led the group in points and was fourth in points per game with 0.44. Then, on April 28th, Toronto signed Grundstrom to a three-year entry level contract. As a result, he was able to play in six postseason games for the Toronto Marlies, where he added three goals and an assist. One year after being drafted, Leafs fans should be pleased with the trajectory of Grundstrom’s game. He continues to make improvements in his skating and strength while putting up solid points in a professional league. Joseph Woll became the first goaltender drafted by Toronto since 2013 when they selected Antoine Bibeau 172nd overall. He is undoubtedly their top goalie prospect and gave Leafs fans reason to believe in him with his performance at Boston College. As a freshman, Woll backstopped the Eagles to a very solid season. 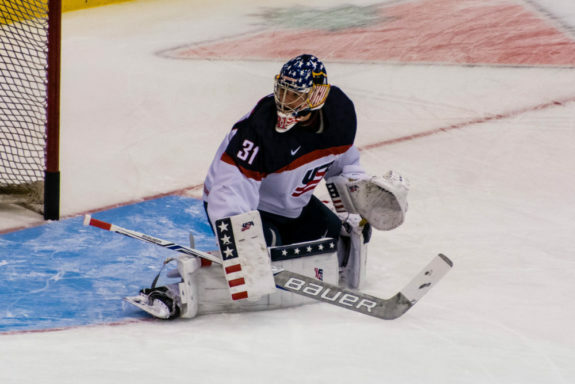 He also continued his dominance on the international stage, earning a .935 SV% over two World Junior Championship games for the U.S.A. Woll was one of just three starting goaltenders in the NCAA under the age of 19. As uncertain as goalie projections can be, Woll’s is promising because of his success at all levels of play. He uses his 6’3″ frame to cut down on shooting angles and has a very cool demeanour between the pipes. He will continue to play at Boston College for the next couple of years, at least, but expect his numbers to continue to climb, and he will have more opportunity at the IIHF U20’s. In the third round, with their fifth pick of 2016, Toronto selected their first defenceman in J.D. Greenway. The hulking left-handed defenceman enjoyed his freshman year at Wisconsin, imposing his size and grit against older, stronger competition. Standing at 6’4″, 205 pounds, Greenway plays a punishing game along the boards. He adjusted well to the NCAA, focusing on the defensive aspect of his game. While Greenway isn’t expected to be an offensive dynamo, he does have the mobility to jump into the rush and create opportunities. Greenway continued to develop into a solid defender this season and is making strides in his all-around game to bring promise to the Leafs’ prospect system. Given his natural size and strength, combined with his smooth skating, Greenway continues to look like a potential top-four defenceman down the road. Drafted two years older than his peers, Adam Brooks used the 2016-17 season to prove his critics wrong, again and again. After putting up 120 points in 2015-16, Brooks bested himself by adding 10 more this year. An intelligent player who thinks about the game, Brooks was honoured as a finalist for our Leafs’ Prospect of the Year. Despite taking a few years longer to develop in the WHL, Brooks has become one of the top point producers in League history. While not the flashiest player, Brooks competes hard during every shift. His coaches trust him in all situations and he has developed into a tremendous leader. Heading into next year, Brooks will hope to earn some sort of contract with the Leafs, which seems inevitable, and earn experience at the AHL level. Similar to Connor Brown, if Brooks can continue to develop his game with the Marlies, he could see NHL action by 2019. A pick that had most of Leafs Nation asking “Why?”, Keaton Middleton has continued to take huge strides in his overall game. Standing at 6’5″, 234 pounds, Middleton is a tough defenceman to play against. While many complained of his inability to produce offensively, he showed his potential over the course of the year. Playing for a lacklustre Saginaw Spirit team, Middleton played big minutes against the opponents’ top lines. He was stellar on the penalty kill, and while his skating still needs some work, it has grown leaps and bounds over the past two years. Middleton will return to Saginaw next season, continuing to hone his defensive game. While he may not be the most exciting prospect that Toronto has to offer, he isn’t someone to turn your nose at. A massive frame, great strength, and skating ability that is coming around will make Middleton an intriguing player to track. Another of many over-aged draft picks from 2016 is left-winger Vladimir Bobylev. The 6’2″ Russian enjoyed a breakout season in 2015-16, leading the Leafs to believe he was on the verge of something great. He went home to Russia to play in the KHL this year, but by the time Christmas rolled around he decided it wasn’t working out. Bobylev returned to Victoria for the remainder of the season, where he had greater success than he did in the KHL. He continued to show his impressive playmaking ability but was unable to take that next step to become an elite goal scorer. It’s fair to assume that Leafs management was hoping for a more significant jump this year or even a better showing in the KHL, but Bobylev remains the same player they drafted a year ago. With that said, his likelihood of becoming a full-time NHL winger looks relatively slim at this point. 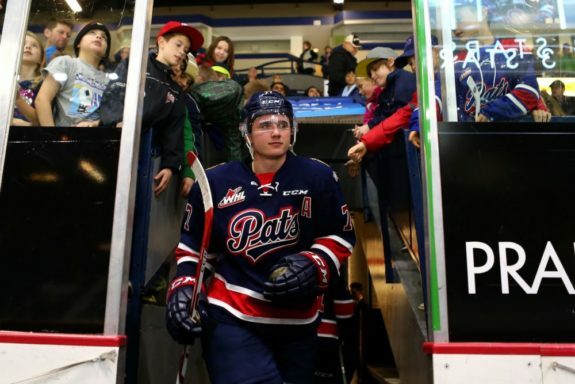 Bobylev’s linemate in Victoria, and yet another third-year draft eligible player, Jack Walker was unable to dominate the WHL like many expected. A unique prospect, Walker entered the WHL as a defenceman but was converted to a winger. After two years, he requested to be moved back to the blue line. He enjoyed a successful season as a defenceman, leading the League with 18 goals, but was bumped back up to forward the following year. That is where the intrigue lies, in that Walker clearly has the ability to be an effective player both up front and on the back end. However, as an over-ager in the WHL this year, Leafs Nation was likely hoping Walker would be among the League’s top tier point producers. That was not the case. In fact, Walker took a slight step back. He is ineligible to return to the WHL next year and may be a candidate for Toronto’s ECHL affiliate, the Orlando Solar Bears. Nicolas Mattinen was an interesting selection in the sixth round and likely chosen because of Mark Hunter’s influence. While Mattinen didn’t receive huge minutes in his draft year, he was able to make an impact as a defensive defenceman with a 6’4″ frame and great strength. Flash forward one year and he is coming off a year in which he was one of London’s go-to defenders. Although he didn’t add to his potential offensive upside, he continued to hone his game in his own zone. He possesses a very hard shot but was unable to make any significant impact with it throughout the year. Mattinen will return to London next season as one of the team’s leaders, but don’t expect him to suddenly put up solid offensive numbers. He will never be a flashy defender, but he is trustworthy in the defensive zone. While NHL potential is thin for Mattinen, keep an eye on what Hunter has planned for him in 2017-18. While Nikolai Chebykin may be a relatively unheard of prospect, he continues to give fans a reason to remember his name. Albeit another over-aged draftee, Chebykin enjoyed a breakout season in the MHL in 2015-16. This year, he followed that up by playing at a goal per game pace through 17 games, before being redirected to the VHL. He was also able to give the KHL a test run but wasn’t given much opportunity during an eight-game stint, averaging just 2:46 of ice time. Despite bouncing around three leagues this year, Chebykin was to develop an electric release with no true holes in his game. As a 20-year-old next year, Chebykin will vie for a full-time KHL role, hopefully proving an ability to play professionally. In the long-range forecast, it will be intriguing to watch his development as a goal scorer. The best case scenario would have Chebykin in North America after two years of growing into a professional in Russia.